This fall RVS will be introducing a new process for communicating student learning is being unveiled after three years of planning and review. The Communication of Student Learning Process is designed to help K-8 students build knowledge of themselves as learners while capturing their proficiency in demonstrating learner outcomes and facilitating conversations of the next steps on the student’s learning journey. 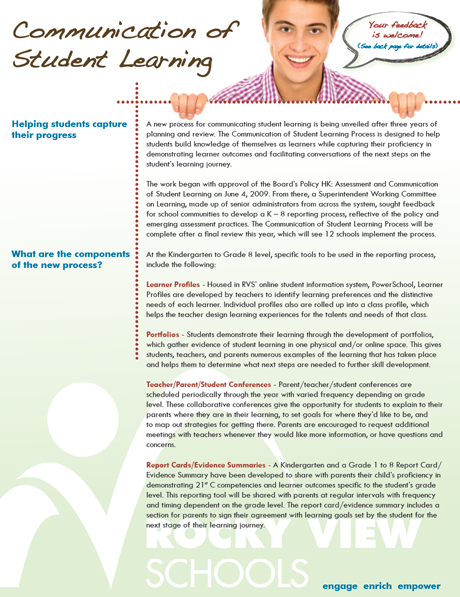 Learn more by reading our Communication of Student Learning Communique. Teachers and parents also can learn more about assessment in Rocky View Schools by going to the new Learning and Teacher folder. An entire section has been dedicated to “Assessing”. Over the course of the year, this folder will be updated to ensure RVS school communities keep abreast of its new assessment process and any new developments. Teachers and parents can send their reflections and feedback on the new process by email to: assessment@rockyview.ab.ca.